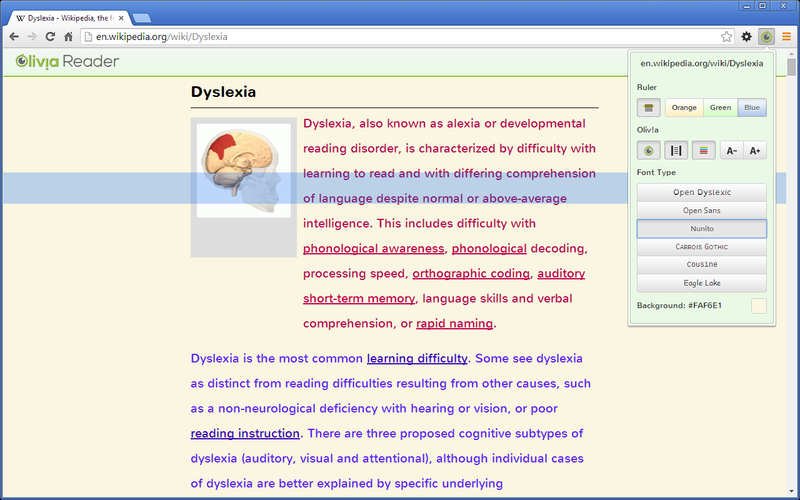 Using Google Chrome, visit the website you want to read. 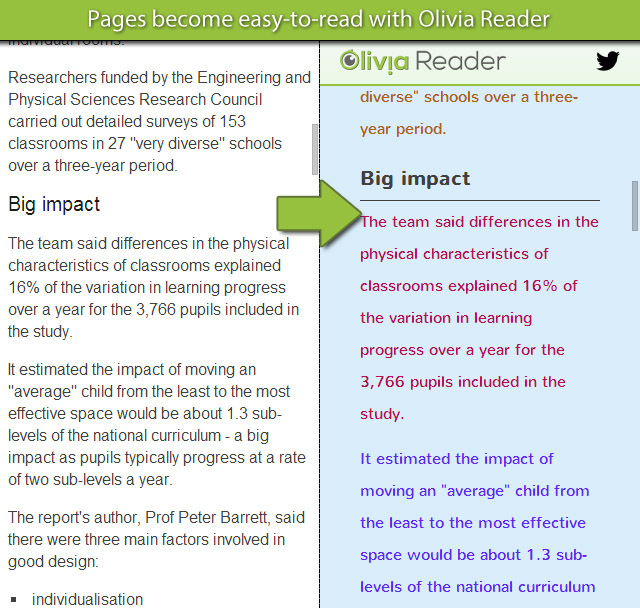 Click on the Olivia Reader green icon and open the control panel. Let's start by changing the page appearance. Open the control panel and click on the Olivia icon that is under the word "Oliv!a". You can change the page background colour by clicking on the little square at the bottom right of the control panel. Don't forget to click OK once you have found the colour you like the most. 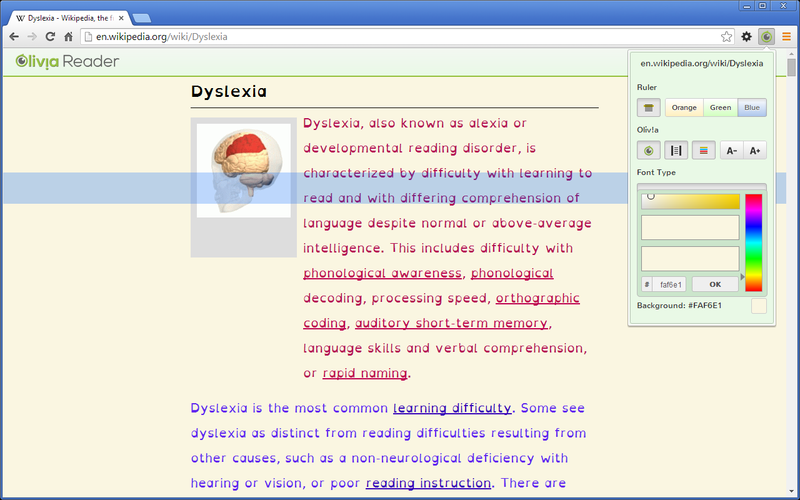 You can reduce the page width by clicking on the button with black lines. You can stripe the paragraph colour by clicking on the third button. 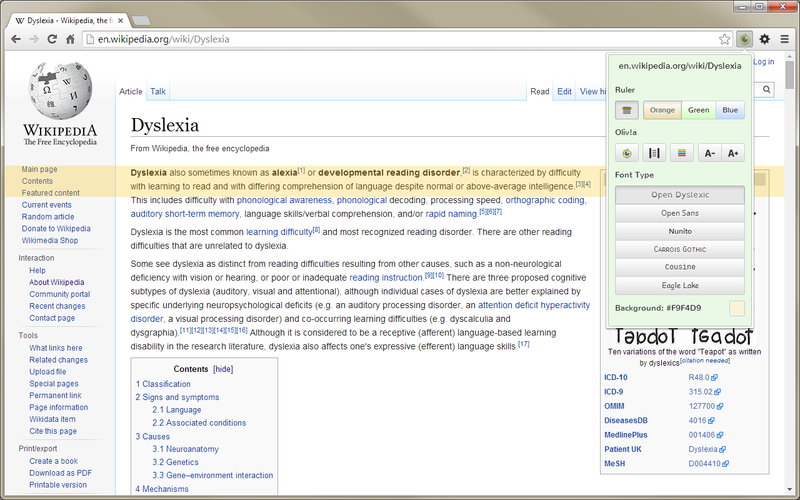 You can change the font size by clicking on the A- and A+ buttons. You can change the font type by clicking on the font name. Finally, you can use just the Olivia Ruler, without changing the page look and feel. Turn the ruler on and off by clicking on the button that is under the word "Ruler". Then, change it's colour to Orange, Green or Blue. Now, move the ruler up and down the page by dragging it around with your mouse. 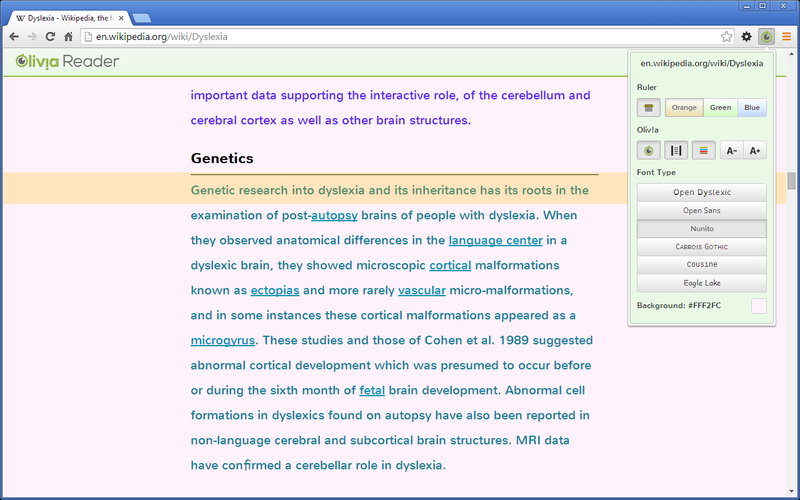 Olivia for Google Chrome - school research made easy. Download! Olivia Reader on the news!!! Nothing is impossible in the mind of the imaginative child! I am a Software Architect and the father of two very creative children. Every day they come up with the most fantastic ideas and listening to them I wondered how many other amazing ideas children around the world might be having right now that might be turned into an equally amazing mobile app. This gave me an idea of my own – to create a country-wide competition encouraging children to use their creativity to come up with an idea for a mobile app, a mobile app that I could develop and the profits from which the competition winners could share. The Super App Idea Competition was born. In 2014 children from all around the UK, submitted their super app ideas. Many were unique and exciting and were crying out to be turned into a mobile app. But I had to choose just 3. Sarah Riches from Putney told me that her younger brother is dyslexic and asked if she could have an app to help her brother with reading. She was awarded the second prize but I decided to build her app first because 1 in 10 children in the UK have some level of dyslexia and could benefit from such an app straightaway. While researching the subject of dyslexia, I was lucky to meet 12 year old Olivia Loder who is the Young Ambassador for the British Dyslexia Association. Listening to her story, I decided to name the app Olivia Reader. You can help Sarah’s brother, Olivia and hundreds of thousands of other children by downloading the app or sharing this video!